I could find no details on the net to assist removing and replacing a MX5 NC rear brake caliper. The http://www.melens.com/mazda site has manuals but if you look through them in detail there are missing sections in the manual with regards to the handbrake cable. Further the Mazda European Portal paid for area, their MESI system, Mazda Electronic Service Information is also missing info around the cable interface to the rear caliper and no torque info rear the bolt that holds the bracket on. In the end all simple stuff once I pulled the outer handbrake cable out the back of the bracket after removing the spring clip rather than getting it out the side of the bracket. Word of warning, never replace any brake or suspension system nut or bolt with run of the mill A2 grade stainless steel items. The majority of stainless steel nuts and bolts have little snap resistance when they are shock loaded. 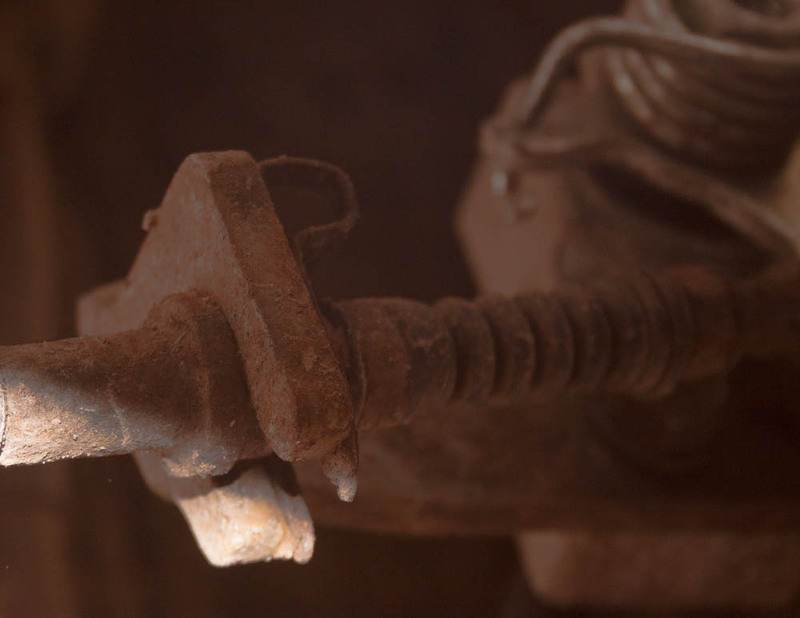 Suspension and braking systems have many shock loads therefore use the correct grade of carbon steel nut and bolt even it does rust. Nor put a stainless steel bolt into a carbon steel casting like the parts detailed below as you will get differential corrosion. The first job is to chock the front wheels and put the handbrake off. Then to slacken off the handbrake cable, this requires the handbrake lever gaiter in the cabin to be lifted. It is lifted from the rear of the gaiter and slid backwards as there are plastic catches on it’s location frame that slide into the front of the centre console. 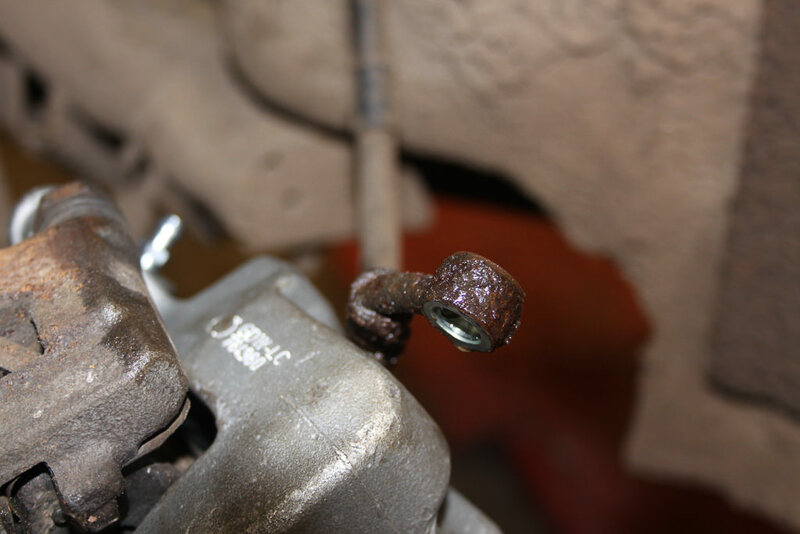 You will now see a 10mm AF adjusting nut on the handbrake cable that requires a deep 10mm socket to access it. 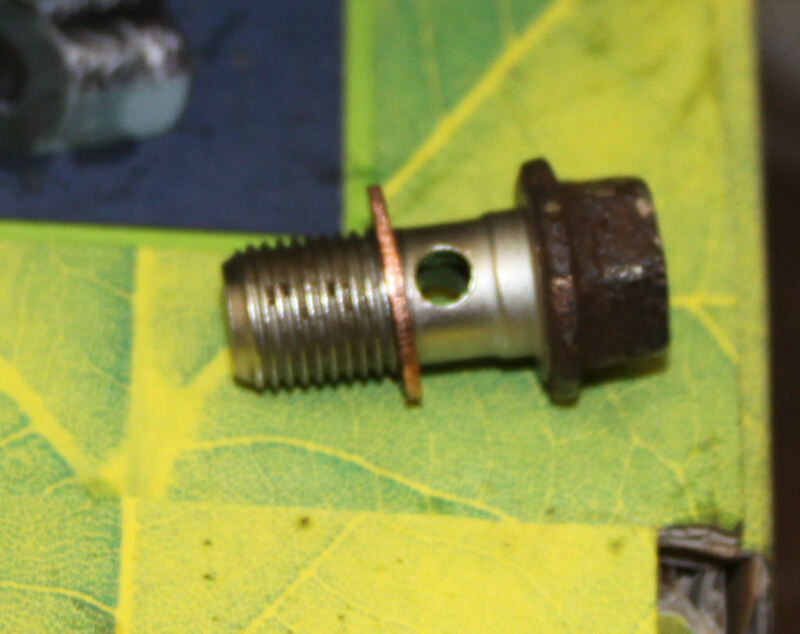 In the case of my car it unscrewed 18 complete turns to the point where there were only a few threads of the nut engaged on the front handbrake cable. 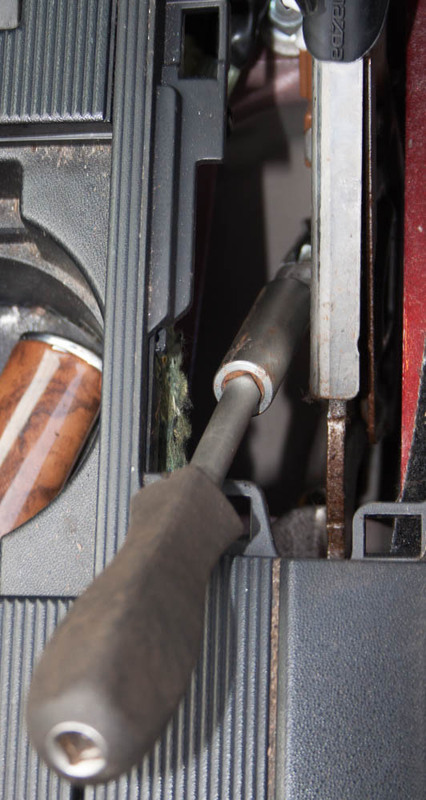 There is one adjuster on the handbrake where the front cable connects to the lever. The other side of the cable pulls on two separate and handed rear handbrake cables. 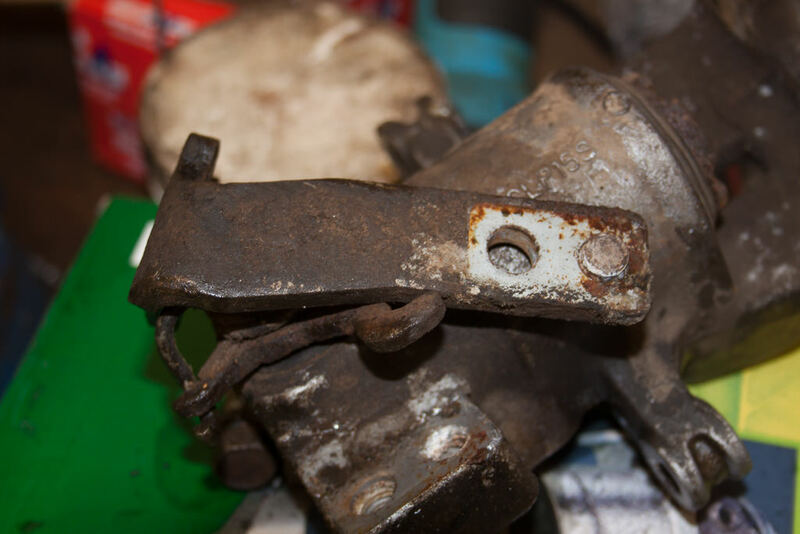 The locking key for the locking wheel nuts has to be found next and the 5 wheel nuts require to be “cracked” prior to safe jacking and supporting the car with axle stands or whatever safe support kit you have. 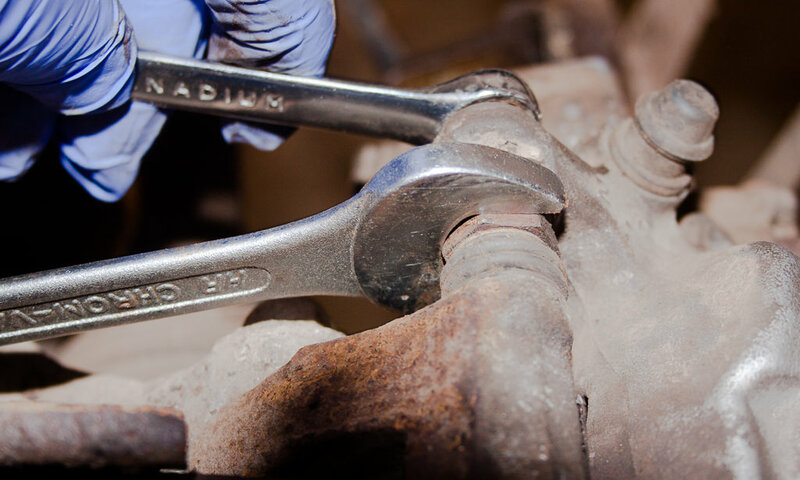 The rear hand brake outer cable that connects to a handbrake cable bracket on the caliper is fixed on by a spring clip that requires to be removed with a medium thickness screwdriver or pliers. It will be covered in road dirt and on my car that is 10 years old it was best described as scabby and I will order a few and replace them all round. A picture of the tip of the spring clip in place. 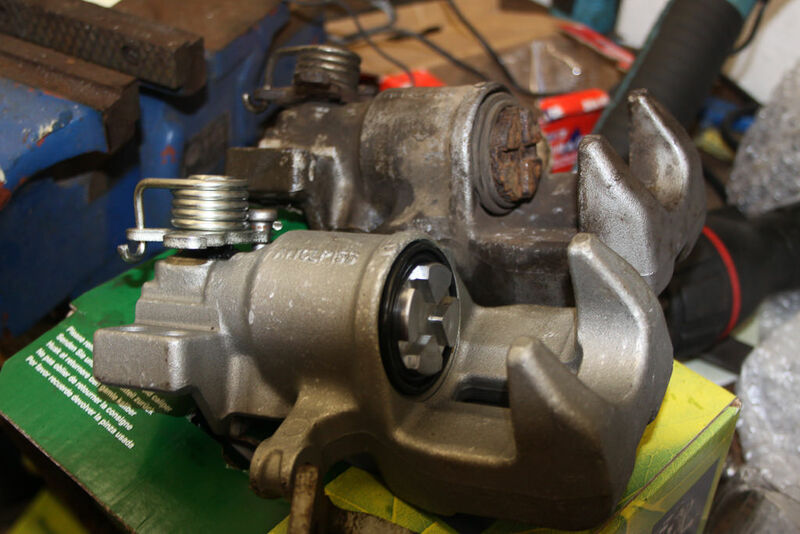 The outer cable is then pulled away from the caliper and disengaged. This allows the outer cable end to be brought nearer the connection of the inner cable to the caliper and the inner cable to be disengaged. Sometimes you have to remove the cable bracket bolt to get enough room to wiggle the outer cable. At this point a helper is handy to check free movement of the inner cable in the outer cable by them pulling on the handbrake and then releasing the lever while you check the movement of the inner cable and in this case it there was no issues with the cable sticking. 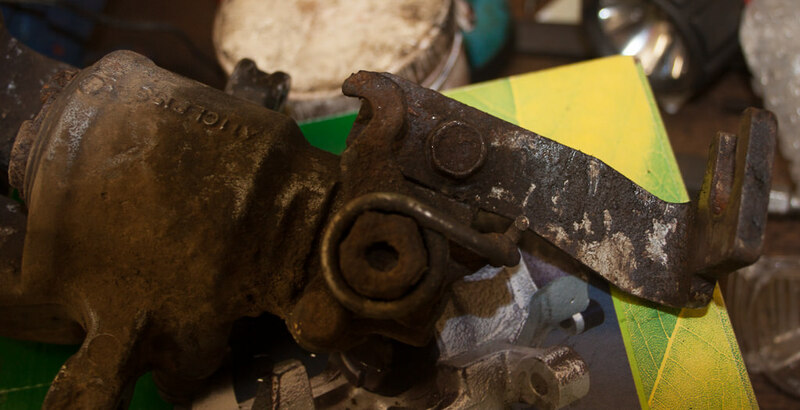 The handbrake bracket to the caliper is held on by a 14mm AF carbon steel bolt M10 1.25mm fine pitch, 20 mm long between the bolt head and the tip of the bolt. It will be quite tight due to corrosion and I would suggest a 6 sided impact socket here and leave the caliper bolts to the caliper carrier still in place to act as a vice to stop the assembly from moving. The bracket needs a wire brush clean. 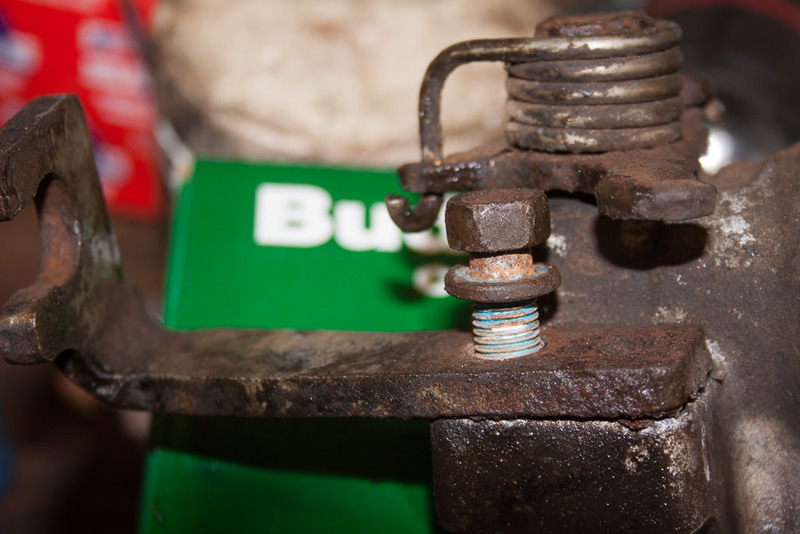 The bolt was rusty both at the junction with the head of the bolt and at the open end of caliper mounting hole. I coppersliped the new caliper threaded hole at it’s extremity for the bracket bolt and cleaned the area of the bolt where there was rust at the bolt head applied a touch of copperslip at the bolt head just a touch and cleaned and applied some thread locking compound in the middle of the bolt away from the copperslip. 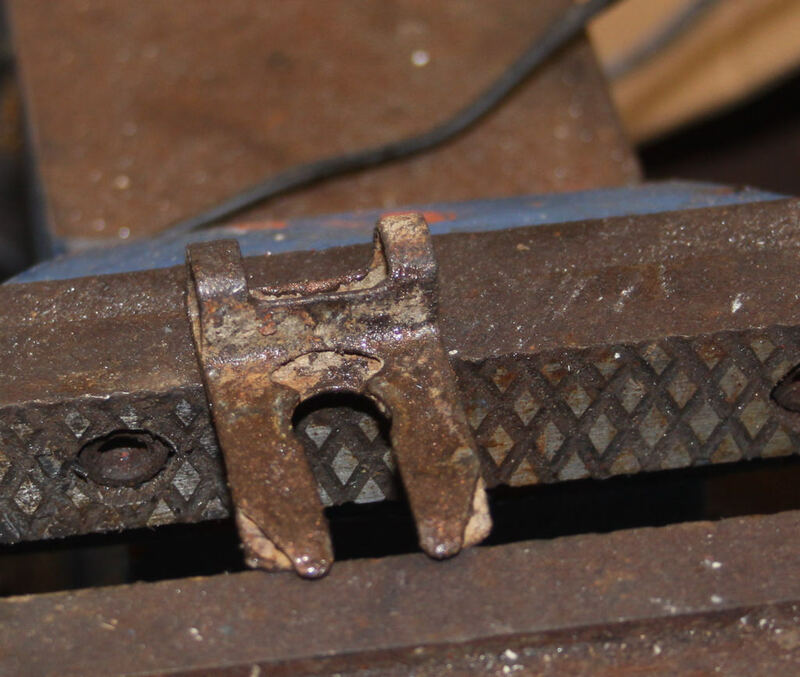 The exposed end of the bolt will pick up the copperslip as it is screwed into the caliper. Next wire brush the banjo bolt head and the area around where the hydraulic hose meets the caliper. There is no need to worry about brake fluid loss as at best the hose only loses a thimble full as the proportioning valve tends to reduce loss, undo the 10mm AF bango bolt, remove the bolt and give it a clean up and replace the two banjo bolt copper washers 15mm OD 12mm ID 1mm thick. A washing up basin is great here below the hub to catch the old brake fluid. Remove the caliper which is held on by 12mm AF bolts but use a six sided socket as they can be a bit tight to get off after a year or so. The caliper is held to the caliper carrier bracket with 2off M8 x 25mm long x 1.00mm pitch flanged bolts these are fine pitched bolts. Note the use of a 17mm AF spanner to stop the slider pin spinning. The two slider pins were removed from the caliper carrier bracket and new red rubber grease was applied and the pins replaced in the caliper carrier bracket, it is worth getting new rubber protectors if the old ones are torn but in this case new rubbers were supplied with the caliper. The caliper itself has less than a cup full of fluid therefore make sure the caliper is directly above the washing up basin when the hose is disconnected as it will catch all the fluid but when you remove the caliper take a minute or so to drain the old caliper into the washing up basin. Yes, I did not do that and had brake fluid over my work bench. The discs are 10mm thick new with a minimum thickness of 8mm, the discs on the car were 9.8mm thick therefore were reused. For information the front Discs are 22m thick new and have a minimum thickness recommendation of 20mm while the front Pads new have friction material 14.4mm thick. Mazda advise a minimum of 2mm of pad material, I would not go much below 7mm. The new caliper was reassembled with the handbrake cable bracket and the bolt hand tightened. The caliper was reinstalled and the 12mm caliper bolts were torqued to 20NM. With the caliper in place the handbrake bracket bolt was tightened to 30NM but there is no info on the “mellens” site manuals or from the Mazda MESI system as to that bolt torque. At that point the gap between the pad backing plates has to be checked as the calipers are set for new pads. 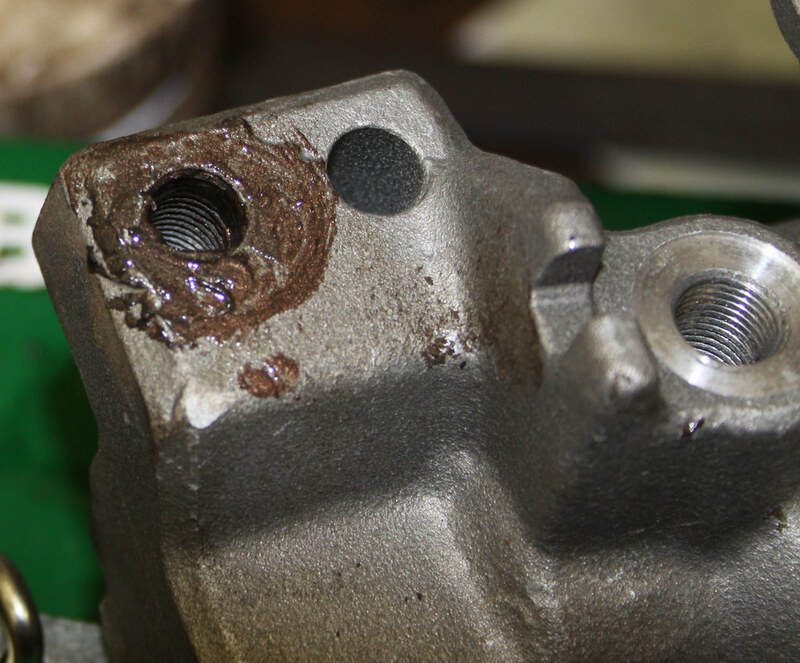 The caliper was removed and the piston was turned out by 1 complete turn as the existing pads were 25% worn. You do not need any fancy tools for the piston turning, a broad headed plain screwdriver will do the job. The caliper was put back, the hose fixed on with the banjo bolt and 2 new copper washers and hand tightened with a 10mm socket on a 1⁄4” ratchet and tightened further 1/8th turn. The two caliper to caliper carrier brackets bolts do not need any extra tightening if you are a bit worried the correct figure is 22 to 29NM and even a 3/8” drive torque wrench is at the lower limit here and a 1⁄4” drive torque wrench is the most accurate device to do this. The inner handbrake cable was connected to the handbrake quadrant lever. 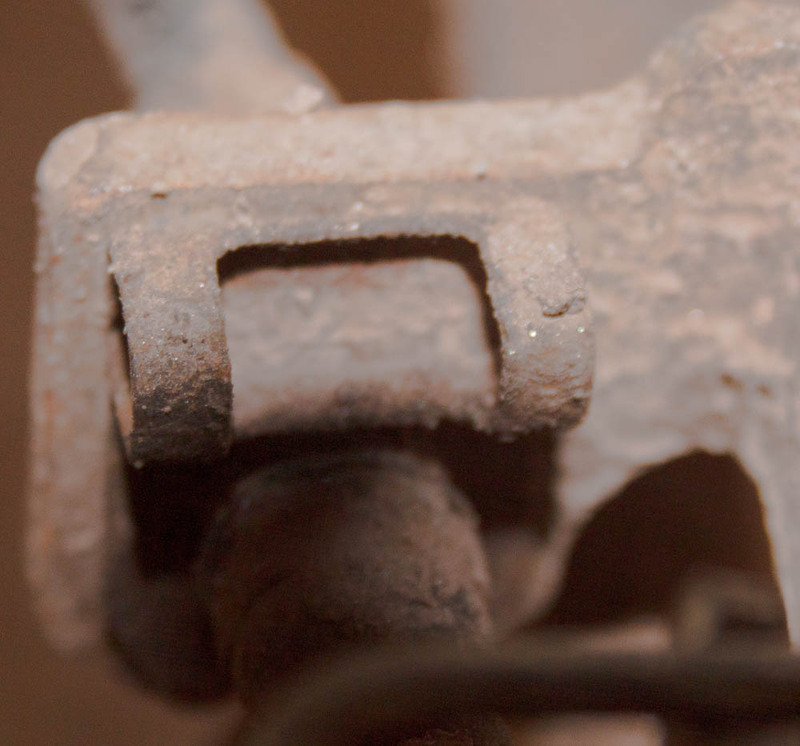 The outer handbrake cable engaged in the bracket and a cleaned spring clip installed to fix the outer cable in place. The brakes bleeding was done with the two person method to get enough fluid through the system as my vacuum bleeding unit was not up to getting a good flow through the proportioning valve. The handbrake cable adjuster was readjusted by putting the adjuster bolt back down 18 turns. 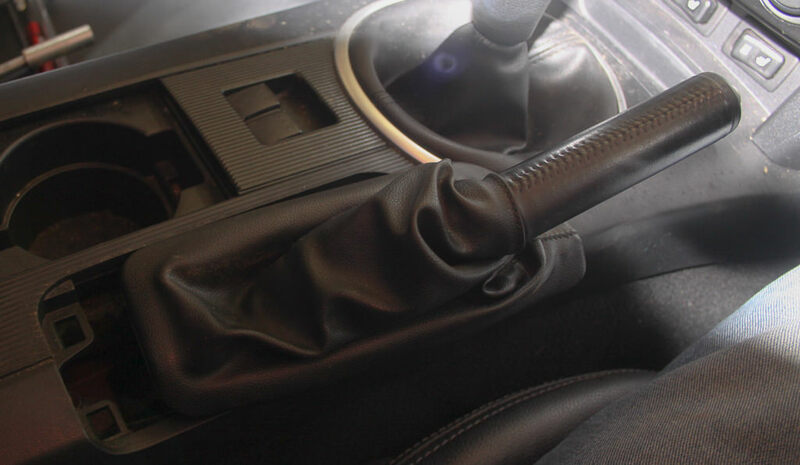 The handbrake operation was checked and the handbrake lever boot was clicked back into the centre console. The wheel went back on and the bolts were torqued to 110NM. Press footbrake say 20 times to get adjusters bedded in. Clear the carnage in the garage and get cleaned up.